The Sewing Summit, a photo by jenib320 on Flickr. 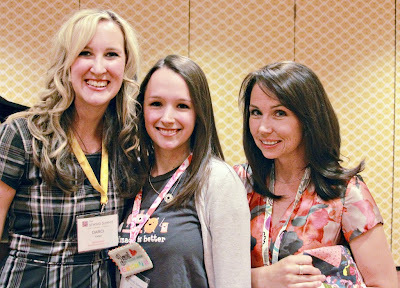 For my first recap of the Sewing Summit, see here! And now, onto a very long post (apologies), with tons of photos! I borrowed lots of photos but made sure to link them up properly to everyone, however if you'd like yours taken off, please let me know, no hard feelings! I simply took no photos of people, hehe! Jeni's class at the sewing summit, a photo by greenleaf goods on Flickr. I struggled for a while, trying to decide how I wanted to run my class, Creative Fabric Selection. In the end, because there were so many students and limited time, I went with a straightforward lecture style. However, I wanted to make sure that there was plenty to see other than my powerpoint presentation. This is where all that crazy sewing I did in the two weeks or so leading up to the event comes in. I made sure that everything I spoke about had an example! As the dust continues to settle around here, I'll make sure to visit each example again in better detail! We covered a lot of topics in a little over an hour, hopefully it wasn't information overload! From color to fabric to finding inspiration, we barely scratched the surface! There is just so much to say about the subject! I could talk fabric 24/7, hehe! I didn't realize until I saw these photos of my class, (most taken by the lovely Amanda by the way!) how much I talk with my hands! My hands are blurry in almost every photo! Anyways, back to the class! Here I am speaking about one of my favorite things I've ever made, my Sparkling Cider quilt made from vintage sheets. We briefly discussed a fabric's intended purpose, and not letting your possibilities for a certain fabric to be limited, and I jumped at the chance to bring along this quilt! Jeni, a photo by amandahall25 on Flickr. Jeni B of In Color Order, a photo by the workroom on Flickr. I ended up going with my original outfit choice for my class, including my 1001 Peeps skirt made using Karyn's awesome tutorial! Sweet Ladies!, a photo by Amy's Creative Side on Flickr. My lovely friend Angela, just so happened to also be my class assistant! She was fabulous! :) It was comforting to have a familiar face up there with me! Saturday Night Dinner, a photo by Faith: Fresh Lemons. Saturday Night we attended an awesome dinner put on my Jennifer of Ellison Lane Quilts and Elena of Breakfast for Dinner! This was one of three tables filled with sewing peeps! 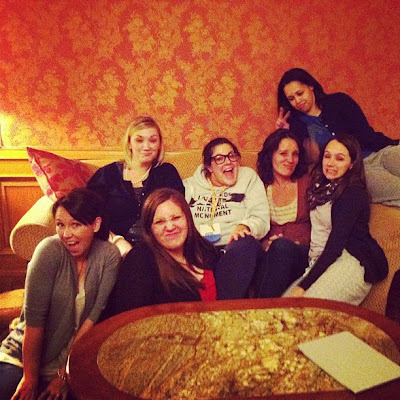 From left to right: Rachel, Angela, Jessica, Amanda, Me, Faith, and Elena! Another great picture.., a photo by Erin - TwoMoreSeconds on Flickr. Most nights were filled with chatting and handwork, some worked on knitting projects, some on embroidery, paper piecing, etc. Glad we got this fun shot thanks to a willing passerby! Such fun ladies! From left to right: Erin, Megan, Holly, Amanda, Angela, Amanda, and myself! Me, Jeni & Erin, a photo by Darci - Stitches&Scissors on Flickr. 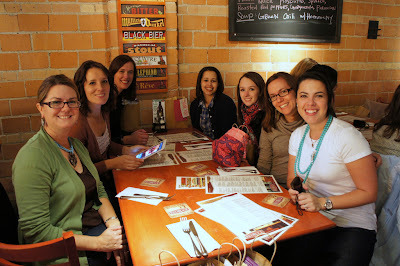 Amanda H, Kait, Karyn, Amanda J, Katherine & Jeni, a photo by the workroom on Flickr. Karyn worked her photo magic right before we all left and got some really rad photos! Top left to right: Amanda, Kait, Karyn. Bottom left to right: Amanda, Katherine, Me. Amanda & Jeni, a photo by the workroom on Flickr. Quite a few of you at Sewing Summit did not realize how tiny George bunny is! So, I took some "for scale" photos of George today next to a standard diet coke can! :) He really is tiny, I swear! Fabulous Fabric Stacks, a photo by jenib320 on Flickr. And finally, the fun bloggy news I promised! I think I may have mentioned this in my last Sewing Summit post, but not in detail. The Art of Choosing is back! I'm going to go in depth about a wealth of new subjects, most especially color! For those of you who came to summit, you'll recognize some of it, but I'll be going into more detail (hopefully!). If you're new here, feel free to catch up on past posts here. I'll have the first post, on the color wheel, up next week! George is so cute. And I love that last pic of fabrics, the colours are so girly and fun. Looks like a fun time! And I look forward to hearing more about your Art of Choosing continuation! Ok, for a minute I thought George was in your hotel room during the Summit or something and I missed it! LOL! It was so great meeting you Jeni and I just hate I was not able to take your class. I heard it was AWESOME! :) Thanks for the scale photo of George- he's just so adorable! Your sparkling cider quilt is one of the most beautiful I have ever seen....wow!! One of these days I am going to one of these summits!!!! I would love to meet you all!!! I was JUST reding through your art of choosing today. Can't wait to see what else you add to it. It was so incredibly helpful. Thank you for sharing your awesomeness! George is so tiny and precious! amazing jeni! love all the details. and george, oh my gosh, so tiny. our beagle pepper would love him to death, literally. I want him. 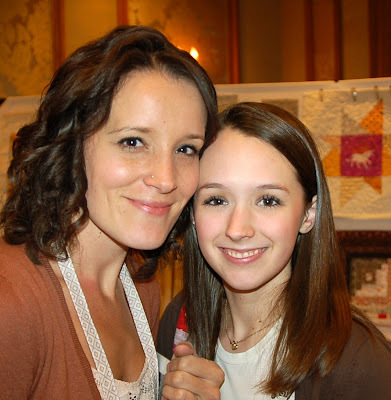 O live reading about the sewing summit! And I am very excited that you will bring some more of your knowledge onto your blog! I am looking forward to more info on the "art of choosing" - this is a really difficult part for me that should be more fun and less scary - thank you for throughing it into the blogworld! Oh my goodness! I never realised how teeny georgyboy is?! We need more comparison photo's, just because he's adorable. I'm thinking george in a teacup? By the way, what is the top fabric in the stack? Its gorgeous! I am still so sad that I wasn't there. I bet it was a great class, and it was really the one I was most looking forward to take. I feel like I lack when it comes to color, even though it always seems to work out in the end. I look forward to all of your future posts on the topic! It was such a great weekend! I just wish I would have been there longer but oh well! Your class was awesome you did such a great job really! Looks like you all had the best experience at SS and you completely rocked that peeps skirt!! it looks and sounds like you had a blast!